Okay, maybe the lights didn’t flicker and if there was thunder we didn’t hear it. But it might as well have (complete with thematic music to underscore the drama of this pivotal plot point), for all the shock and horror displayed by the Papeete Visitor Centre officer when we told him we didn’t have a full meal plan for our upcoming visit to Bora Bora. “How will you eat!? You know Tahiti is expensive one time. Moorea two time. Bora Bora three time,” he admonished us. (I wonder if Tourism Tahiti knows about this subversive element in their midst). “You must get cereal bars and Tupperware and then at breakfast you know,” he mimes slipping food from the breakfast table into the imaginary Tupperware container on his lap. “You must!” he declares with an emphatic nod and another dramatic wide-eyed stare. Enjoying a pre-prison breakfast in only “1x expensive” Tahiti. We had just popped into the tourism office to find out if they had any advice or a good map for our self-drive trip down to Teahupoo the next day. It turned out the visitor centre officer, who transformed from portly bored desk worker to flamboyant best-friend in a matter of seconds, did have some advice for us; quite a lot to be precise. The unsolicited, but highly entertaining, feedback claiming that we had pretty much made the wrong decision at every step of the way also included a scolding over the choice of car rental. Umm, no we chose Avis. Because we’ve heard of them and they have a website that comes up when you google ‘car rental Tahiti.’ Unlike Eco-car. Once we advised him that no, we were not rich, his focus shifted to the doom and gloom we could expect as prisoners of a five star resort. We left the visitor centre with the assurance that we would definitely be coming home short a kidney each… because we would either need to sell them or eat them due to not being able to afford lunch and dinner (I gather he was not confident about our breakfast stealing abilities). With the exception of the roulottes, this highly entertaining stop was probably the highlight of our time in Papeete itself. As a lot of tourist information will tell you, there is not much to see in the city of Papeete. It made for a nice half day look-around but you don’t need to put a lot of time aside to explore the town area. 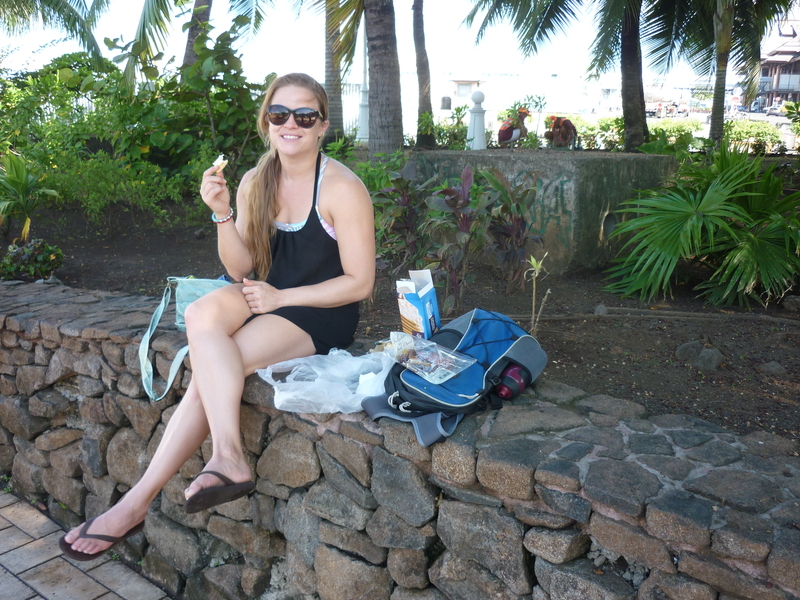 We did enjoy a lovely picnic breakfast on the waterfront in Papeete. One of our favourite things to do while traveling is to pick up a French stick, cheese and other picnic bits and have a relaxed meal somewhere awesome. And in all seriousness, it is often a nice alternative to a $60+ breakfast or lunch. 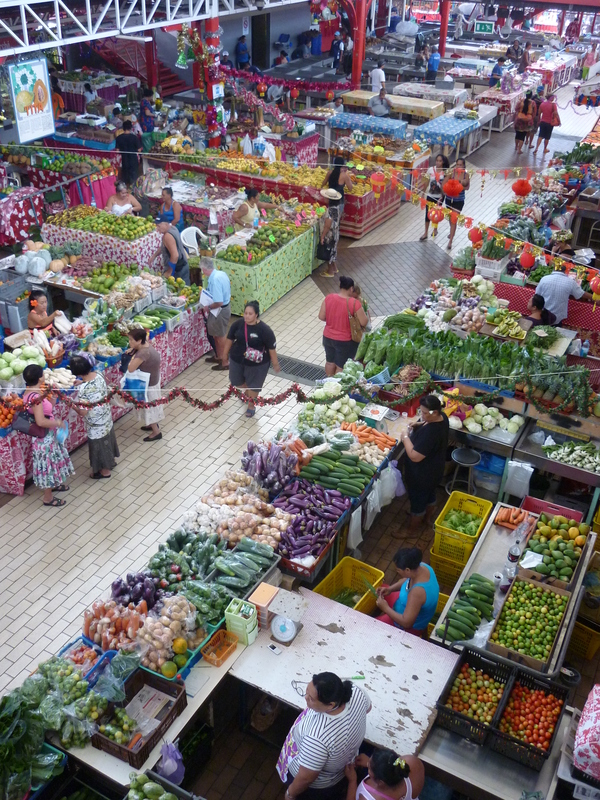 Papeete also offered an enjoyable walk around its lively public markets. Set just back from the waterfront, the markets offer everything from souvenirs to fresh produce and flowers. The town itself is bustling without being overwhelming and can easily be walked in a couple of hours. Although the French Polynesian capital doesn’t offer days and days of excitement, it is worth considering spending a couple of days in a resort or pension in that part of the island. There are stunning views across to the island of Moorea, and in our case a lovely pool to enjoy them from. There are also lots of options for day tours from the area including 4×4, snorkeling, island circle tours as well as boating, fishing and more. Plenty of ways to relax once you have exhausted all Papeete has to offer. Will Bec pawn her newly acquired wedding ring to survive? Will Ryan become embroiled in the black market organ trade in return for a chip sandwich? How will they survive as prisoners on the motu? Stay tuned to find out. 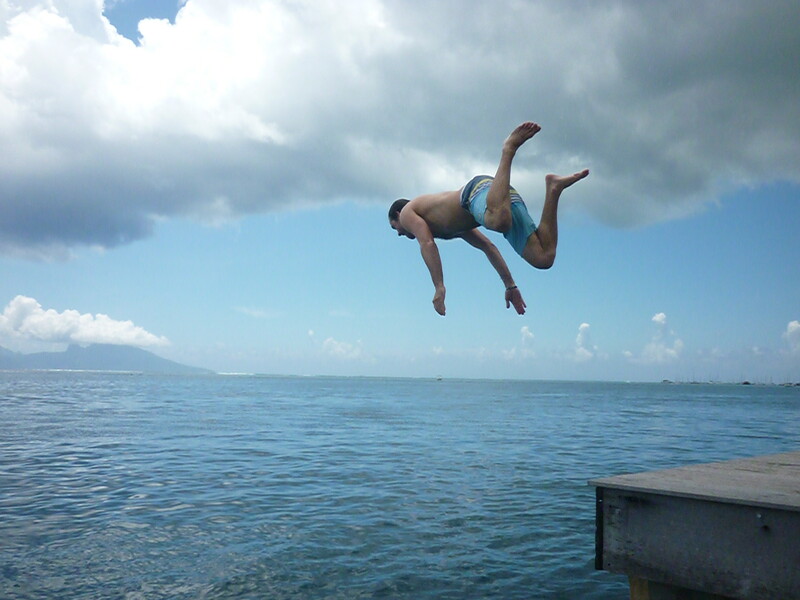 This entry was posted in Not all about Brando, Travel and tagged Papeete, Tahiti. Bookmark the permalink.